A gastronomical journey through the fine establishment that is FoCo. Foco's menu on Friday is usually either a hit or a miss, the logic being to invent and recycle dishes using the ingredients and leftovers from earlier in the week . While this saves the folks in the kitchen a little time and money, these quick dishes rarely leave patrons' tastebuds satisfied. Today's hotline menu, Chipotle Chicken Pasta, Baby Carrots and Potato Crusted Cod offers an eccentric and somewhat pleasant change from other bland innovations. The pasta is at least true to its name. Farfalle is tossed with strips of grilled chicken breast and red, green, and yellow bell peppers, held together by a not too heavy alfredo sauce. The delicate sweetness of the yellow bell peppers balance the slight smoky spiciness of the dish and add to it an enjoyable and vibrant color. I found the baby carrots to be a poor coupling to the pasta, the color taking away from the lovely presentation of the dish. A better selection would have been a simple salad of spring greens with a lightly sweetened dressing of a citrus fruit base to balance and accentuate the flavor of the pasta. The Potato Crusted Cod, although a dish separate from the pasta and the carrots, seemed worth a try but after my first bite I immediately regretted spending the $6.95 that put my DBA at an even lower negative balance. Tasting the cod reminded me of a similar dining experience in New York when, in a supposedly "famous "Irish Pub, I ordered the special of the day, Potato Crusted Salmon, It must have been a Friday because the waitress put in front of me what looked like the experiment of a sous-chef who had been given 7 minutes to create a dish that used all the left-overs of the week, which happened to include hashbrowns, salmon and mustard. Despite the odd aesthetics of the dish, I took a bite and immediately sensed an unpleasant collision of textures in my mouth. The tough flakiness the salmon was met by the too crispy texture of the hashbrowns. I'll avoid dwelling on the miserable taste because it will not erase the experience nor the obscene price I was charged for the meal. Recycling and invention of new menus isn't limited to the hotline, one finds in the dessert case on Friday innovative cupcake recipes that can bring some form of satisfication at the end of a meal. Today Foco debuted the White Chocolate Raspberry cupcake. Shavings of white chocolate and a raspberry sauce covered chocalate truffle finish off the intricately piped vanilla buttercream icing that covers a moist yellow cake. I truly commend Foco on its innovation in the area of desserts as they add a modern and elegant twist to simple and traditional yellow cake white icing recipes. A sweet ending to a mediocre dinner. Today, after finishing two final papers, I had one of my rare breakfasts at the HOP. Little did I expect my dining area to be a political space. 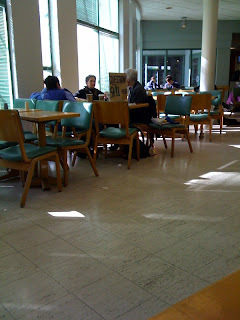 Conspiracy theorist(s) had a large sign up on a table in the middle of the Courtyard Cafe's dining area titled "Question 9/11" along with pamphlets. Three elderly people were seated discussing the supposed conspiracy. Personally, as someone from the New York City area, the whole thing made me sick to my stomach after finishing my egg whites on a wheat wrap. But, regardless of your political views, I think most of us can agree that Dartmouth's dining areas are not a place for political groups to setup shop. Whether they're extreme fringe groups or not. I just wanted to have my breakfast in peace. DDS should do something about this. This was not the first time either, I saw the same conspiracy table setup at least twice before at the Courtyard Cafe in the last month. It's private property, can't the administration kick them out? Or are they purposely choosing to look the other way? Flavors of the Mediterranean themed Homeplate's dinner menu on Wednesday, which included Pesto Chicken and Fettuccine with Artichokes and Tomato. Since the pasta was made a vegan option I took the initiative to modify it a little by adding feta cheese from the salad bar and 2 T of virgin olive oil. A satisfactory meal except for the rather dry and tough chicken.